Well it is Friday - and that means it is time for a new Playing in Paradise Challenge! 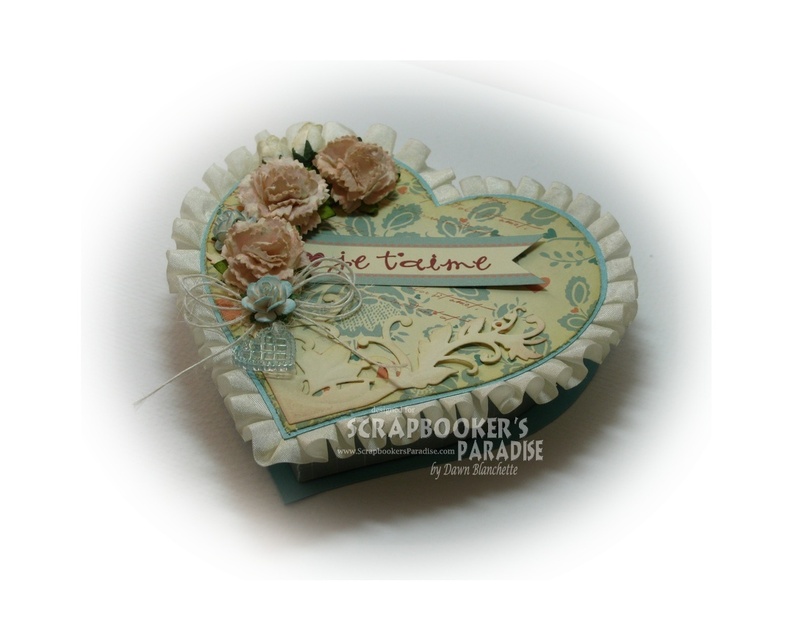 This week it is my turn to host and I thought that with Valentine's day being just around the corner it would be fun to make something that is inspired by a loved one. I hope you will join in! You can make whatever you like using any product you like as long as it is for or about someone you love. I'm looking forward to seeing all your creations! For this challenge, I made a heart shaped treat box.... from scratch. What can I tell you - it seemed like a good idea at the time! I am really happy with how this turned out, but it took a lot of efforting. I framed the cover with some seam binding ribbon that I pleated to create a ruffle. 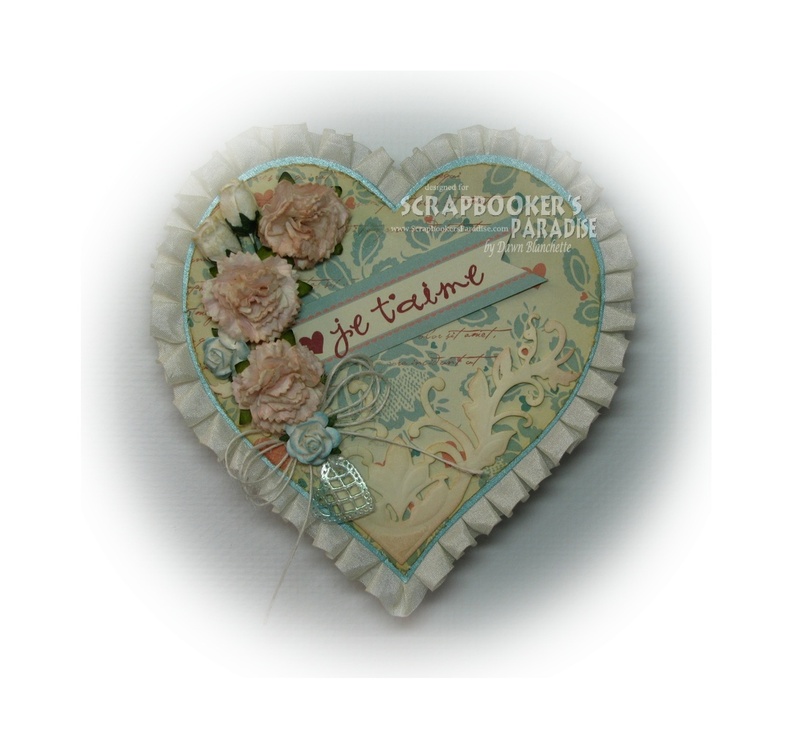 The beautiful die cut was in my new box of goodies and is Spellbinders Fantastic Flourish 2. I then added some Pretty Petals flowers that I coloured with Distress inks (tattered rose, tumbled glass and antique linen). I finished it off with a twine bow and a quick and easy little heart charm that I made with a large Martha Stewart punch. Want to know how to make your own tiny charms? You'll have to pop on over to my Playing in Paradise post to see my super quick how-to. The box itself was made with bristol board and heavy shimmery cardstock. I covered it inside and out with pretty papers from Bo Bunny - Love Letters. The sentiment is a banner cut out from one of the Love Letter papers. If you decide to be adventurous and make your own heart shaped box - the lid opening should be 1/8th inch larger than the base to ensure a proper fit. 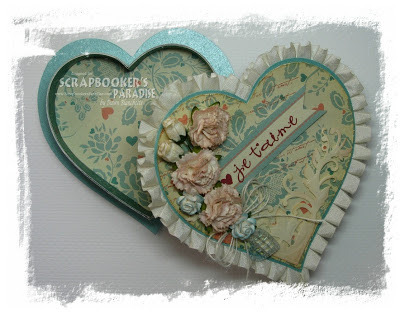 If you haven't already been, pop by the Scrapbooker's Paradise blog to be inspired by the wonderful creations the team and our guest designer have made. Then link up your own Valentine or project inspired by a loved one. You let the flu in? Goofballs! I hope you get the chance to rest - it's the only way to kick it back out again. Your project is AMAZING, Dawn - I can't wait to try your trick of embossing powder on the shrink plastic. That's too cool! WOW! This is stunning Dawn and definitely worth all your hard work. I love the design, gorgeous colours and wonderful detailing too. Sorry to hear you have had the flu bug I hope you feel loads better soon. Hope you are feeling better Dawn. This little box is so pretty. Love your embellishment tut. How did you do that pleating so perfectly? Your flu sound like a vampire, ask it to leave :). I hope you are feeling better. This box is stunning Dawn, I love the soft colours and beautiful details. OH WOW, what a supper heart shaped box! I have to say your efforts have really paid off! It is truly AMAZING and decorated beautifully! Oh MY! "made with a little effort" ??? Looks like a lot of time, energy and love went into your project, Dawn, and it is gorgeous! I stand in awe (LOL) that you actually did all the pleating with the seam binding ribbon. It must have been fun embellishing it. A gorgeous project, Dawn. Of course, I've pinned it, tho it is likely my fumble fingers cannot perform the necessary functions to make a lavish gift like this. Thank you for sharing your incredible heart, Dawn, in more ways than one . Wow, this is fab Dawn! Gorgeous creation. A truly beautiful creation Dawn, so brilliantly createand scrumtious colours and papers - your details are very pretty!!! This is absolutely beautiful. I checked out the how to for the embossed heart charm as well, what a great idea! This is gorgeous Dawn! It looks like a ton of work but so worth it because it is so pretty.